Adjustment theory can be regarded as the part of the mathematical geodesy that deals with the optimal combination of redundant measurements together with the estimation of unknown parameters. It is essential for a geodesist, its meaning comparable to what mechanics means to a civil-engineer or mechanical engineer. Historically, the first methods of combining redundant measurements originate from the study of three problems in geodesy and astronomy, namely to determine the size and shape of the Earth, to explain the long-term inequality in the motions of Jupiter and Saturn, and to find a mathematical representation of the motions of the Moon. Nowadays, the methods of adjustment are used for a much greater variety of geodetic applications, ranging from, for instance, surveying and navigation to remote sensing and global positioning. The two main reasons for performing redundant measurements are the wish to increase the accuracy of the results computed and the requirement to be able to check for errors. Due to the intrinsic uncertainty in measurements, measurements redundancy generally leads to an inconsistent system of equations. Without additional criteria, such a system of equations is not uniquely solvable. In this introductory course on adjustment theory, methods are developed and presented for solving inconsistent systems of equations. The leading principle is that of least-squares adjustment together with its statistical properties. The inconsistent systems of equations can come in many different guises. They could be given in parametric form, in implicit form, or as a combination of these two forms. In each case the same principle of least- squares applies. The algorithmic realizations of the solution will differ however. Depending on the application at hand, one could also wish to choose between obtaining the solution in one single step or in a step-by-step manner. This leads to the need of formulating the system of equations in partitioned form. Different partitions exist, measurement partitioning, parameter partitioning, or a partitioning of both measurements and parameters. The choice of partitioning also affects the algorithmic realization of the solution. 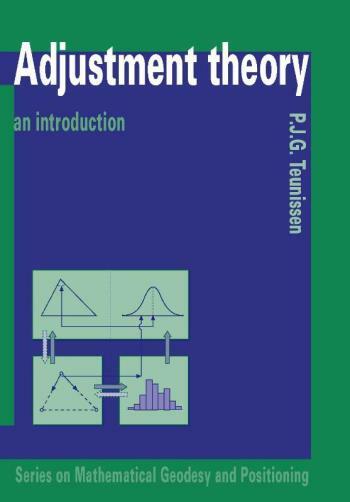 In this introductory text the methodology of adjustment is emphasized, although various samples are given to illustrate the theory. The methods discussed form the basis for solving different adjustment problems in geodesy.